NBC Sports Predictor awards cash prizes to winners. The first game is Premier League Pick ‘Em, where you have the chance to win $50,000 in a single contest! Just predict the scores of five featured matches. Do you think Liverpool will win 2-0 this week? Enter it into the app. If you correctly predict the score and outcome of all five matches, you could win or split $50,000. Even if no one wins the $50,000 jackpot in a given contest, $5,000 in guaranteed prizes will be awarded to top finishers every contest. Premier League Pick ‘Em is completely FREE to play! 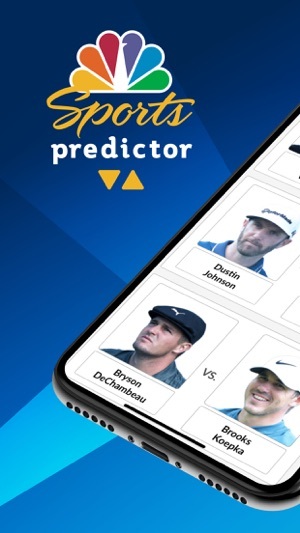 NBC Sports Predictor is designed to enhance your NBC Sports viewing experience. The contests will update in real time in the Live Results section of the app, so track your picks to see how you’re doing. 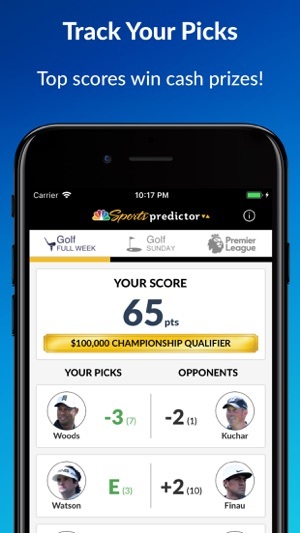 If you are at the top of a leaderboard or have a chance for a big prize, you might just see your username mentioned on NBC! NO PURCHASE NECESSARY. Void where prohibited. Legal residents of the 50 US states who are 18 or older. 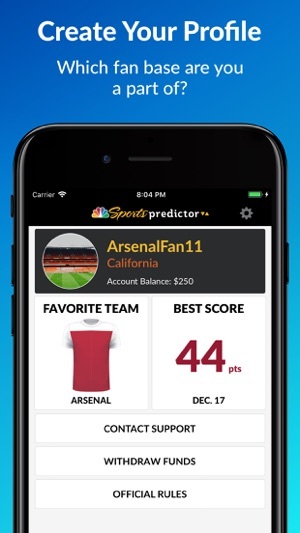 See Official Rules at https://sports.nbcsports.com/2018/12/08/nbc-sports-predictor-contest, which govern, for complete details. 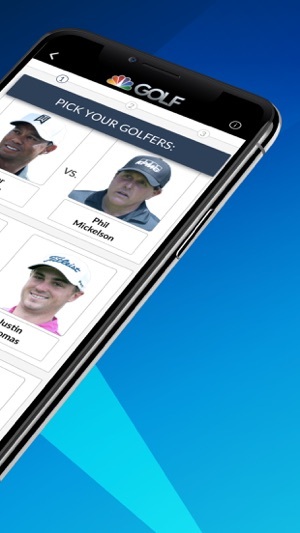 New golf improvements and formats! 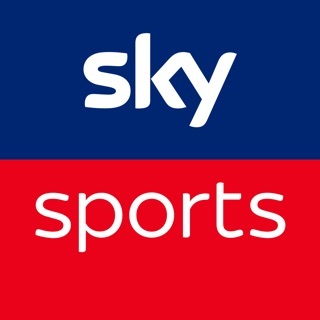 I’ve always loved Premier League, especially now that I can see Spurs every week on NBC (not like the old days of watching grainy satellite feeds at an English friend’s house). 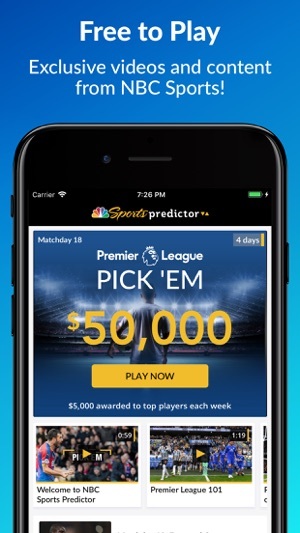 This app does for fantasy soccer what NBC Sports did for EPL - broadens the base and allows more people to enjoy, while simultaneously featuring enough detail and goodies for expert fans. You get extra content, a reason to watch even more games...oh yeah, and win $5,000 a week or $50,000 if you get them all right. Like the early days of HQ, it makes for appointment television. Can’t wait to see what they do next. Only thing that would be better is if Men in Blazers narrated some voiceovers. Under profile sub minuets the app does not update ones score. First week I had a score of 12 in the month of December. In the second series of games I had 28 but this has not been added and updated. Second you guys might want to add features to show different stats for how many people won in each category of numbers and optionally the amount of money in each category. Top winners, etc... Thanks also for the great app nice idea for the contest! Hey BahramPaiani - Your best score under the profile tab occurs once the contests have been completed, which is at 10 pm ET on the last day of the contest. Please let us know at nbcsportspredictor@boomfantasy.com if it still hasn't updated. And thank you for the feedback regarding stats and top winners. I've passed it along to our product team to review. I’ve noticed once in a while that I can’t view live updates in the premier league while matches are in progress, the one time I texted the problem they got back to me immediately and I was told they were getting the “BUGS” out. Not 5 minutes after that the problem was fixed and I haven’t had any problem since. Awesome job, Fantastic site. I Salute you guys, job well done.